Casting the Wes Anderson Love in the Ruins, cont. You are here: Home / Walker Percy / Love in the Ruins / Casting the Wes Anderson Love in the Ruins, cont. 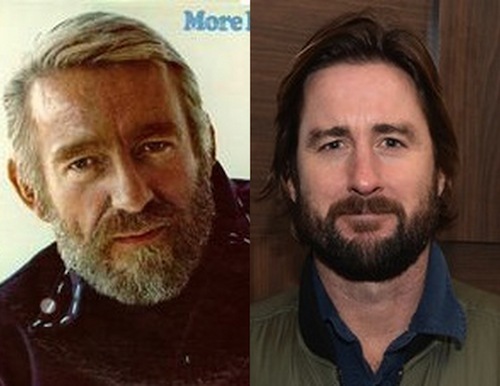 That’s Rod McKuen on the left, and that’s Luke Wilson on the right. A bold choice for Dr. Tom More? Sure. But sometimes, you gotta ignore the naysayers and press on. I already committed Wilson to a Rockford Files movie, but we can do a workaround. Bring Anderson by some night. Is Jonathan Webb playing Rockford’s dad? For half a second, I thought the guy on the left was Scott Hahn, which created a great deal of cognitive dissonance. Oh man… I wish Dr Percy were alive so he could go on EWTN Bookmark with Doug Keck! That Rod McKuen is a handsome fellow. Maybe we should go for Michael Fassbender or Christian Bale? Can you see either of those fellows as the kind of knowing wreck that More is? Fassbender would be too intensely ruined, Bale too wild-eyed. It has to be the sort of fellow that people can say “I know you had a bad time, Doc” to. Fassbender will be too busy playing Lancelot Lamar for Quentin Tarantino. I take your point. Tom More is not Moses, though perhaps he would like to be. What about that guy from Arrested Development and a not-so-great movie with Jennifer Ann is ton? He’s got the wreck thing down pretty well. Look, Quin, if your heart is really set on someone else, I’ll consider Kenneth Branagh. Check The Gingerbread Man for his Southern bona fides. Rod McKuen is thrown in just because of the mention in the book, right? I’m confused about why the next post is #3. The girl says that More looks just like Rod McKuen, so I’m using that as a visual guide. Wilson is the best Anderson regular; Branagh might be the best overall. Oh, right. Got it, thanks. I added a tag to all the posts so a single link can be sent to Wes Anderson.